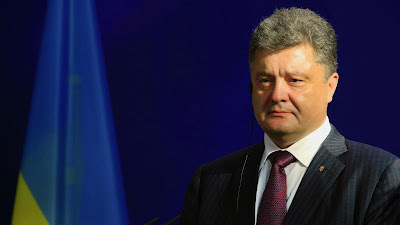 KIEV, Ukraine -- Ukraine’s president, speaking a day after the nation’s junk credit rating was cut further, said next year’s budget mustn’t cut corners on military spending and should account for the possibility of an invasion. Addressing Ukraine’s National Security Council, Ukraine’s President Petro Poroshenko urged expenditure on the army of 5 percent of gross domestic product in 2015. Addressing Ukraine’s security council, Petro Poroshenko urged expenditure on the army of 5 percent of gross domestic product in 2015. The government should target NATO guidelines on military spending and seek to meet the alliance’s entry criteria, he said yesterday in Kiev, the capital. “The war made us stronger, but has crushed the economy,” Poroshenko said. Ukraine is finalizing next year’s fiscal plan amid a new cease-fire in the conflict that’s ravaged its industrial heartland near Russia’s border. As its economy shrinks and reserves languish at a more than 10-year low, it’s also racing to secure more international aid to top up a $17 billion rescue. Standard & Poor’s said Dec. 19 that a default may become inevitable, downgrading Ukraine’s credit score one step to CCC-. With official forecasts putting this year’s contraction at 7 percent, the government needs $15 billion on top of its bailout to stay afloat, according to the European Union. To unlock the next tranche of the International Monetary Fund-led package, it plans to approve a 2015 budget by Dec. 23. An IMF mission, which visited Kiev Dec. 9-18, will return early next year. “The delay in IMF disbursements in 2014, coupled with significantly reduced foreign currency official reserves, increases the risk that the Ukrainian government might not be able to meet its obligations,” S&P said in a statement. The European Union and the U.S. are discussing $12 billion to $15 billion in aid to Ukraine and “there needs to be a Russian contribution to the package,” Pierre Moscovici, the 28-nation bloc’s economy commissioner, said at a Bloomberg Government event this week in Washington. A decision is needed in January, he said. Poroshenko spoke by phone with IMF head Christine Lagarde, according to a statement early yesterday morning on the president’s website that didn’t give further details. The hryvnia, this year’s worst performer against the dollar with a 48 percent plunge, was little changed at 15.8193 a dollar Dec. 19 in Kiev, data compiled by Bloomberg showed. In eastern Ukraine, another 24 hours passed without fatalities among Ukrainian troops as they square of against their pro-Russian adversaries, according to defense spokesman Volodymyr Polevyi. While the truce has stemmed deaths, which exceed 4,700 since the conflict began, according to the United Nations, no date has been set for a new round of peace talks in the Belarusian capital of Minsk, he said yesterday in Kiev. Oleksandr Turchynov, head of Ukraine’s security council, said yesterday in Kiev that the draft would be reintroduced. The self-proclaimed Donetsk People’s Republic, one of two breakaway regions in eastern Ukraine, wants to join Russia, its foreign minister, Aleksandr Kofman, said in a website statement.